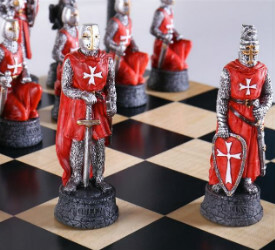 If you are fascinated by crusaders, catholic church, castles or even dragons, these unique medieval chess sets will take you back to a different era. The number one complaint regarding low quality chess sets is that they break easily. This is often because of the subpar materials that have been used in their construction. To get the most for you money, make sure to check what kind of materials the chess board and pieces are made from. Look for high quality woods, cast metal, and durable resin composites, and always be wary of a listing that doesn’t disclose what materials were used or is unnecessarily vague about it. Remember to pay special attention to the chess board that’s included with any medieval chess set. Sometimes, buyers can get so caught up in admiring the beautiful, hand painted chess pieces that they fail to notice the cheap chessboard that was thrown in underneath them. Sellers know this, and the more unscrupulous among them will take advantage of that by slipping in low quality chess boards as part of a set with impressive chess pieces. Always be sure to check that the board and pieces are of comparable quality- a bad board can bring your whole set down! 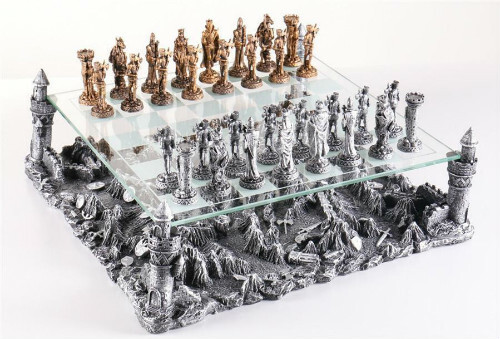 This 3D chess set is absolutely stunning. It will definitely become a conversation piece in your home or office, if not a total showstopper. Each element of this set is incredibly detailed as well as impeccably crafted. The floating glass playing surface is suspended above a dramatic battleground littered with discarded shields and crumbling towers, lending some gravitas to your games. Gold and silver chess men are locked in eternal battle with each other on a platform suspended high above the ground. If you’ve ever longed for more drama in your chess set, The 3D Medieval Knights Chess Set is the one for you. Speaking of the chessmen, each one is cast from metal and coated in either gold or silver colored metals. They have a natural weight to them from their solid metal construction that makes them easy to play with and lends them stability on the board. 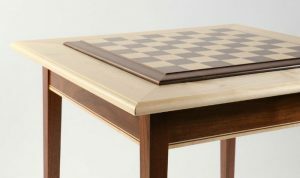 If you’re a nervous type, you may even be afraid that placing a piece too emphatically will cause the pieces to break right through the glass playing surface, but don’t worry about that- the glass of the chess board is plenty strong enough to handle regular use. The chess board in this set is much more than just a simple checkered board. 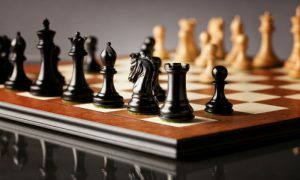 It adds a lot to the overall design of the chess set, with its large size and detailed base. 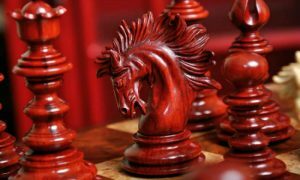 This chess set is not only a stunning piece crafted from the finest materials- it also has a unique story behind it. It is themed around the Crusades – a bloody period in history fraught with religious tension. The Crusades, frequently cited as taking place between the years of 1095 and 1292, were campaigns led by European Christians into Muslim lands, designed to either convert or exterminate the people found there. You might think it’s an odd event to choose to immortalize in the form of a themed chess set, but The Crusades were a very important world event that shaped the world and still influences attitudes even today. The chessmen are modelled after important figures and buildings involved in the Third Great Crusade. The Christian army is led by King Richard I of England, perhaps better known as Richard the Lionheart as he tries to recapture the Holy City of Jerusalem with help from King Philip II of France. The Muslim leader, Saladin defends his home territory from the invading forces. With The SAC Crusaded Chess Set, you can play out history with every game- who will be the victor this time? 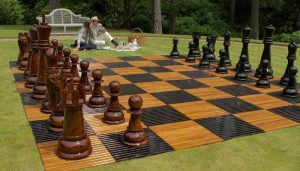 The chess pieces in this set are crafted from high grade polyresin, which is a crushed stone composite that looks and feels like stone, but is as durable and easy to care for as plastic. Each piece is painstakingly hand painted by artists, making each set unique. 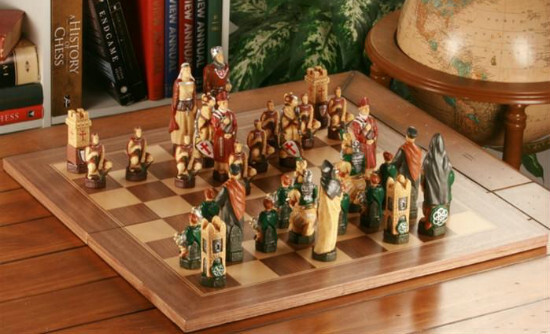 This Renaissance chess set is another that’s based on The Crusades. 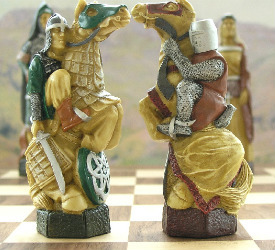 This one is unique however, as it seems to feature two armies of nearly identical chessmen, rather than the clear European and Middle Eastern styling that’s featured in other Crusades themed chess sets. 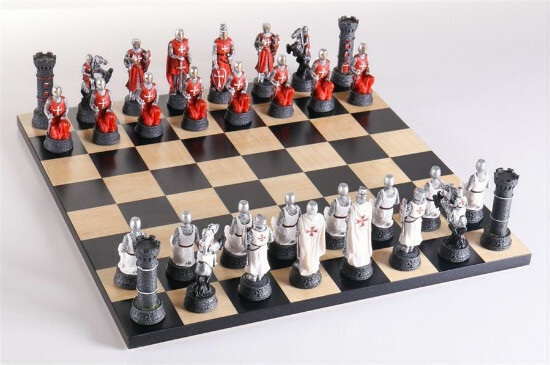 This Medieval Crusade Knights Chess Set features two armies of chessmen – one red and one white, both clad in what looks like classic European armor and weaponry. Rather than Christians facing off against Muslims, this medieval chess set seems to feature two opposing armies of European Christians facing off against each other. It may not be extremely historically accurate, but this set does capture the aesthetic that people typically think of when they think of the Crusades, with Crusader’s crosses emblazoned on each piece, knights on horseback, and castles to be defended. 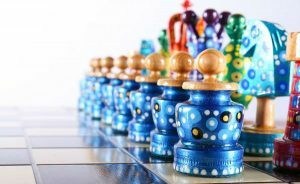 Each durable resin chess piece is also meticulously hand painted with great attention to detail. 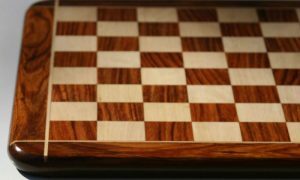 The chess board included with this medieval crusades chess set is a sizable 17 inches square and made of walnut and maple wood. It has a smooth, satin finish that gives the board a soft sheen and makes playing a breeze. This set, packaged in a decorative box with individual piece storage, would make a great gift for children and collectors alike. 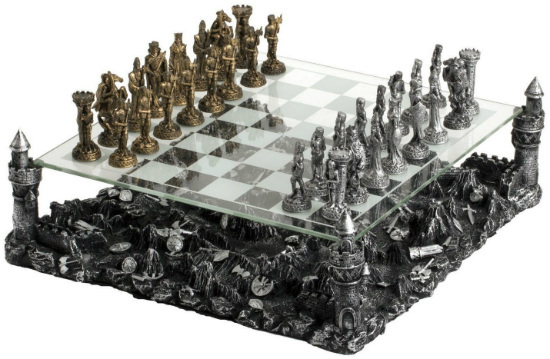 The Medieval Metal Crusades Chess Set and Board is the very picture of a renaissance chess set. It has knights, princesses, castles, and horses- what more could you need from a medieval chess set? This set is also themed specifically around The Crusades, and therefore depicts a European Christian army facing off against a Middle Eastern Muslim army. It’s a perfect gift for history buffs and collectors. The chessmen in The Medieval Metal Crusades Chess Set are made of solid metal and all together weigh more than 6 pounds! Each individual piece is a little on the smaller side, with the King standing only 3 inches tall, but they have a pleasant weight to them that makes them easy to move and a pleasure to play with. The pieces are also hand painted with vivid colors- no simple black and white here! The level of detail on each piece is impressive, and you can really tell that this is a high quality product made with care and attention. 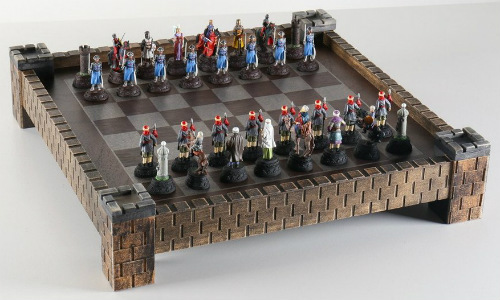 The chess board is one of the more unique features of this chess set, being modelled after a castle’s walls and standing elevated above the table. Despite the big impression it makes, the board itself is actually quite compact at just over 17 inches square. 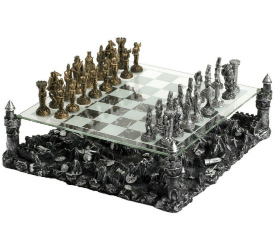 This is overall a compact chess set that won’t take up too much space on a table. 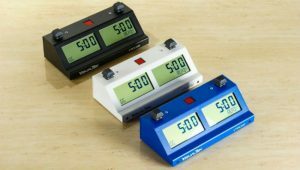 This makes it perfect for playing with in small spaces, or filling out a tight spot in a display of your collection. The Medieval era, also known as the Middle Ages, is a period in history that has long captured the hearts and imaginations of many. One needs only to hear a single tale of King Arthur and the Knights of the Round Table to know that. Unsurprisingly, this fascination with Medieval times has translated into the production and sale of many different chess sets. Many of these are specifically themed around The Crusades, which were a series of religious wars that were sanctioned by the Catholic Church at the time. Though the crusades were comprised of many different campaigns spanning hundreds of years, the most famous of these were undoubtedly the campaigns to reclaim the Holy Land from Muslim rule. The First Crusade was initiated by Pope Urban II in the year 1095. Its objective was to support the Byzantine Empire in their efforts to expel Turks colonizing the region of Anatolia- a peninsula in modern day Turkey bounded by the Black Sea to the North and the Mediterranean Sea to the South. Crusaders had other tasks and goals in the intervening time, and the attempt to regain control of the Holy Land was actually the third crusade. It went on for about two centuries, but ultimately ended in failure for the crusaders, though they certainly left their mark on the region. The Medieval Era was also a time when art was just beginning to flourish- before the chaotic rush of the Renaissance era. Classical art and literature that is still studied today was produced during this era, like the works of Dante, Chaucer, and Giotto. Marco Polo was also exploring the world during this time, and Gothic architecture was getting its start in buildings dotted all across the European continent- buildings that thousands of people still visit to this day. The Late Middle Ages would spell disaster for many Europeans, unfortunately. The Black Death caught hold in 1347, and in 3 years it had managed to kill more than a third of the total European population. Civil strife and peasant revolt rates were high, but nevertheless technological advancements were made that ushered society into the next age- the early modern period.